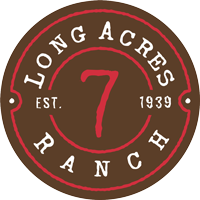 At Long Acres Ranch, we have teaching opportunities that link youth with lessons revolving around the ranch’s natural resources. 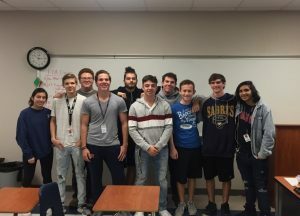 Recently, we partnered with the Seven Lakes High School FFA, located in Katy I.S.D. in Ft. Bend County, to fabricate a structure called a Rainfall Simulator – an educational tool to be used at Long Acres Ranch to show how working lands capture rainfall, rather than shed it. The Seven Lakes FFA Agricultural Mechanics and Metal Technologies teacher, Mr. Godwin, led the students in its construction and now their effort will be magnified as thousands of other students will benefit from the ideas shown during future demonstrations with the simulator. 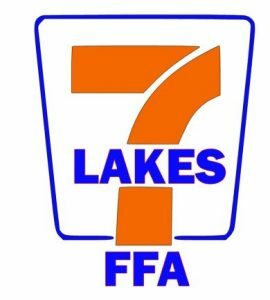 Figure 1: Click on the 7Lakes FFA logo to go to see the good work being done by this FFA chapter in Katy, Texas. 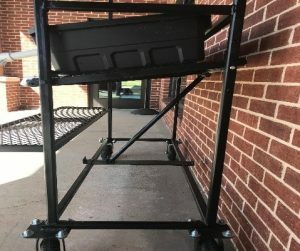 the water could run off the top of the soil surface, also know as the imperviouos layer (if the surface will not allow water to pass through, such as the asphalt), and through the top pipe outlet, draining into the container labeled “run-off water”. 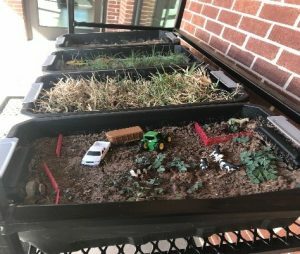 After observing the scenario that actually occurs, students can draw conclusions about the effects of the various soil coverings on surface and ground water. 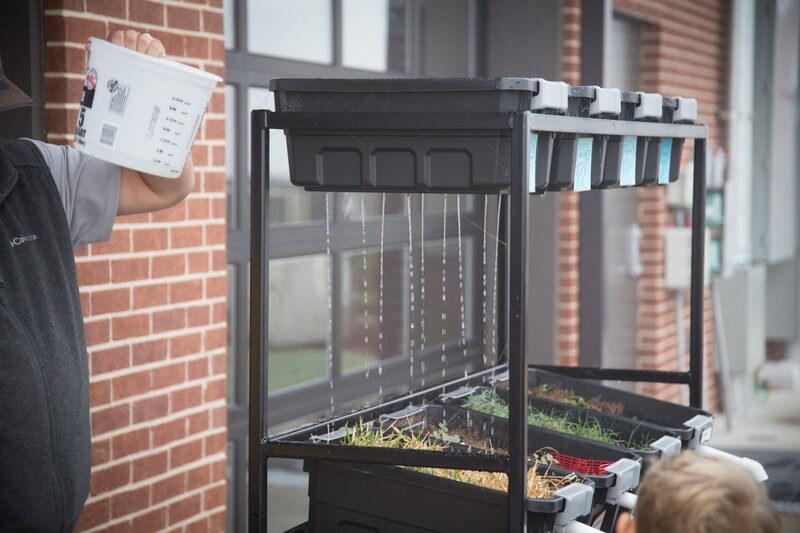 Figure 2: This Rainfall Simulator allows for adjustable slopes, rain-buckets and catch-buckets with varied soil surfaces and the ability to move across tough terrain to set up for demonstrations. Click here for a short video of the slope adjustment feature being demonstrated. Mr. Godwin led a team of 10 advanced welding students in the engineering and fabrication of the Rainfall Simulator. 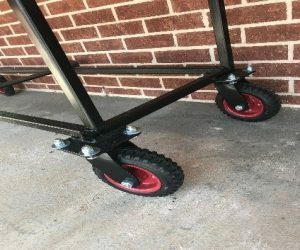 He examined prior versions of Rainfall Simulators, and worked with his team of students to develop pragmatic enhancements to the design allowing for a variable soil surface slope, and sturdier wheels to travel over rough terrain. We had a chance to talk with Mr. Godwin and his team of students and ask questions about their program. Mr. Godwin’s students joined in and answered the following questions. Check out some of their big-time insights into conservation! 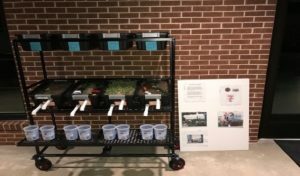 Figure 4 “Building a project like the rainfall simulator is something that I will be able to take back with me knowing that I helped people my age and younger learn about the conservation of our earth.